Glynn served on the Lincs CBA Committee for many years as the Scunthorpe Club Representative, then as Secretary for two years, followed by Vice-Chairman and then Chairman from 2011 to 2014. Since then he has been Competition Secretary. He was a founder member of Scunthorpe Bridge Club in 1977 and has served on the Committee for most years since. He directs at Scunthorpe BC and many County events. He has represented Lincs in the Tollemache and inter-county leagues. He is very active in promoting All Comers Duplicate sessions in the county, to encourage less experienced players to take part in county events. Welcome to the Lincolnshire Contract Bridge Association web site. The Association was founded in 1946. Its aims are to promote and further bridge in Lincolnshire, to organise competitions in the County and to participate in matches with other counties. Our final event of the season is our experimental Afternoon Tea with Gloria and All Comers Pairs at Dunholme Village Hall starting at noon on Thursday May 16th, at a cost of £10 per player. A light-hearted and friendly event but not for those players who are just hunting down Master Points. We want to know if there is a demand for this kind of event. As catering has to be done, it is very important that we have your entry a week before the afternoon. The Men’s and Ladies Pairs Championships were held at Dunholme on Sunday 14th April. Unusually, the men outnumbered the ladies by almost two to one, with14 men’s Pairs and only 8 ladies’ pairs competing together in a 14 round Howell movement. The Men’s Pairs was a very closely fought contest, with two pairs, Paul Wokes & John Brocklehurst and Chris Phillips & Alan Millington achieving the same score, very closely followed by Kiat Huang & Rodney Mitchell. The Ladies’ Pairs was more clear cut, with the honours going to Janet Sharman & Katy Lishman, followed by Margaret McLeod & Hazel Shipley and Trish Herring & Brigid Hughes. Congratulations to all. Thanks to all those who supported this event, to our director Helen Barr and our Competitions Secretary Glynn Elwick for producing another very enjoyable afternoon of bridge, and to Gloria for producing a very appetising buffet lunch. The next event is Gloria’s Afternoon Tea & the All Comers Pairs at Dunholme at 12:00 on 16th May. The County Teams Championship was held at Dunholme Village Hall on 24th March. 8 teams had entered the initial Qualifier Session, and the top four teams played in the Final Session, with the remaining teams playing in the Consolation Session. Congratulations to winners of the final and the Dutton Challenge Cup, Nick Hunter, Ruby Schnalke, Paul Wokes & John Brocklehurst. Congratulations also to the winners of the Consolation and the Turner Brumpton Trophy, Mike Llewellyn, Megan Williams, Glynn Elwick & Peter Stackhouse. The next event is the Men’s & Ladies’ Pairs Championship Teams at Dunholme at 12:00 on 14th April. The final of the Lincs Gold was played on Sunday 17th March. Congratulations to the winning team of Mark Wardell, Kiat Huang, Aaron Hutton & Reg Loosley, who beat runners up Chris Phillips, Alan Millington, John Hill & Maurice Lynn by 19 IMPS over 40 boards. Mark's team will now go forward to represent the County in the Pachabo Cup in June. The full results are shown in the competitions menu. The County Pairs Championship was held at Dunholme Village Hall on 10th March. 25 pairs had entered the initial Qualifier Session, and the top five placed N/S & E/W pairs played in the Final Session, with the remaining pairs playing in the Consolation Session. Congratulations to winners of the final and the Arthur Wilson Trophy, Chris Phillips & Alan Millington. Congratulations also to the winners of the Consolation and the Bell Trophy, Maureen Parsons & Maurice Ladlow, to the winners of the Lucy Osbourne Trophy for the best placed pair aged over 65 in the Qualifier, Glynn Elwick & Peter Stackhouse, and the Margaret Briggs Trophy for the best placed inexperienced pair in the Qualifier, Corinne & Peter Cole. The next event is the County Championship Teams at Dunholme at 11:30 on 24th March. The Swiss Pairs was held at Dunholme Village Hall on 17th February. 23 pairs had entered, resulting in a completely new movement experience for Helen. We played six 6 board rounds except that one round had a 3 board sit out. The computer seemed to know what was happening and produced results after each round telling the players where to go next. Congratulations to winners Ron Wall and Brian Smith, who seemed to spend all their time at the top table, closely followed by runners up Malcolm Hammond and Mike Waters. The results showed a tightly fought contest with only 10 VPs separating the first six placings. The next event is the Bainton Trophy Final at the City of Lincoln BC at 12noon on 24th February, which will be followed by the Championship Pairs at Dunholme at 11:30am on 10th March. The main teams event at the Harrogate Congress was won by a Lincolnshire team of relatively inexperienced players at this level, Kiat Huang, Mark Wardell, Nick Hunter & Ruby Schnalke. The team played remarkably well as they had not played as a team before and had not won any previous EBU event. The Congress was run by Yorkshire Contract Bridge Association on behalf of the EBU. Mel Rowley and Peter Morgan, both from the Pinchbeck BC won the Thursday night heat of the recent EBU Simultaneous Pairs event. They won the Thursday night heat with a commendable score of 68%. This is a considerable achievement. Well done to them both! Congratulations to the City of Lincoln Bridge Club on winning the heat for the Garden Cities' Trophy. The event went to the wire, with everything dependant upon the final match between Lincoln and Louth. In the end Lincoln won that match by 13 VPs to 7 VPs and thus earned the right to represent Lincolnshire in the semi-finals. Click here to see the final ranking table. The first County event of 2019, the January All Comers Pairs was held at Dunholme on the 13th. Fifteen experienced players together with fifteen inexperienced players produce a tightly fought 27 board contest, the eventual victors being Mike Llewellyn & Rennie Bennington. It was a great afternoon of bridge enjoyed by all. The Lincs Gold is the main County teams competition and is a knockout event and is played for Green Points. Each match in the Lincs League is played over 24 boards (12 boards against each pair) and each team plays each other team once. Matches have to be played by the end of the season. One player in each team has to be designated as Captain. This person organises the matches. At the last County Committee meeting the draw for the event was made by our Chairman. Since five teams have entered this year, we will have one preliminary match and then the semi-finals. Mark Wardell (Capt)/Kiat Huang/Sue York/Reg Loosley/Maria Nelson/Aaron Hutton. The preliminary match is Wardell (home) v Wokes (away). This match is 24 boards (32 boards by agreement of Captains). Please try and get this played before Christmas.This match has been played. Wardell (Huang/Loosley/Hutton) beat Wokes (Brocklehurst/Hunter/Schnalke) by 37 IMPs. Wardell will now play Elwick in the semi-final. The semi-finals are Parsons (home) v Phillips (away) and Wardell or Wokes (home) v Elwick (away). These matches should be 32 boards (40 by agreement of Captains). Please try and get these matches played so that we can get the competition completed so that an entry can be made for the Pachabo competition. We will sort out the home team for the Final at a later date. Good luck to all. Glynn. The semi-final between Parsons and Phillips has been played. The match was won by Phillips by 66 IMPs and they now go forward to the Final. The second semi-final was won by Wardell (Huang/Hutton/Loosley) by 28 IMPs. The final will be between Phillips and Wardell. If there is a demand, a team can go forward and represent the County in the Pachabo Cup later in the season. Good luck to both teams. We have four teams entering the competition. This makes it that each team plays three matches. I will try and make it as equal as possible because two matches will be at home and one away and vice-versa. There will be six matches in total. The matches will be Parsons (home) v Elwick, Parsons (home) v Phillips, Wardell (home) v Parsons, Phillips (home) v Elwick, Elwick (home) v Wardell, Phillips (home) v Wardell. Usual rules apply. Results to me after each match. Please try to get matches played within a reasonable time. It seems very difficult to imagine that we will not be able to get six matches played before the end of the season but you never know. Good luck to all. Glynn. 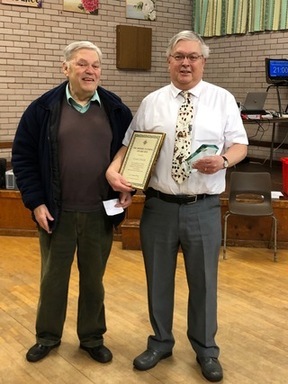 Over the last few weeks, Roy Brixton (County Rep for Scunthorpe BC ) has been attending meetings in Nottingham BC in order to pass the course to become a Club Tournament Director. Recently his Directing knowledge has been tested and he was not found wanting. I can report that he passed his exam at Distinction level. Well done, Roy. We now look forward to seeing you Directing events at the Scunthorpe BC. We have been needing help in this matter for a long time. Any other members who want to do the same as Roy should speak to any Committee member at Scunthorpe BC for further details. Contact details of Team Captains: Glynn Elwick Tel 01652654872. Mark Wardell Tel 01507480515. Mo Parsons Tel 01526342047. Chris Phillips <chrisphillips959@icloud.com> Paul Wokes Tel 01205368077. Please refer to Competitions section on the Home Page for full details of results. The fantastic work being done within the County at three of our schools is being rewarded when, in early July, a group of @ 20 young bridge players from the county will visit Parliament for a game of bridge against a team from the House of Lords along with a visit to the Upper Chamber. This is a brilliant opportunity to showcase junior bridge in the County and a massive well done to all involved in setting this up. If anyone in the County wants to take the initiative and help develop schools bridge where they are, contact Deidre Fell or Reg Loosley, who have gained great experience in this over the years. All members who play in our County, be that within our clubs, or in County events, are reminded that they are expected to behave in line with the EBU standard for Bridge and the Best Behaviour code. I am always keen to know about either your views about Bridge in the County or if you have any news to publicise to the other members of the County. If you have then give Glynn a call on 01652654872 or send me an e-mail at glynglo@gmail.com. Please click the link below to access the EBU Calendar. This duplicate event is intended to provide a relaxed and enjoyable afternoon of bridge whereby experienced players may introduce less experienced players to County events. There are no specific rules, but by general agreement it is expected that an experienced player will partner a less experienced player who is not a regular partner and has little experience of County events. Guidance may be taken from the EBU National Grading Scheme. It is suggested that an experienced player at grade 10 and above should play with a less experienced player of grade 9 or below. Bidding systems should be simple at EBU level 2.
at least a week before the event. The Waitrose Trophy is awarded at the AGM to the Pair with highest percentage score in a club duplicate session in the previous 12 months. Please notify Adrian Underwood if you achieve a higher score.